Global Rapid Strength Concrete Market size was estimated over USD 270 billion in 2016 and will exhibit growth of over 7% up to 2024. Rising construction activities in Asia Pacific and the Middle East & Africa will contribute in rapid strength concrete market size during the forecast timeframe. Rapid strength concrete is able to develop high resistance within a short time after construction. This feature enables the early removal of the formwork which not only speeds up the construction process but also reduced overall cost. With the increasing need for high speed construction processes all over the world, rapid strength concrete is poised to witness fast increase in demand in coming years. The European construction industry has slowly revived from the economic downturn, with residential construction output increasing by 1.5% on the previous year in 2015. Germany, France, and UK have been at the forefront of this growth with the German residential construction increasing by 2.7% in 2015. The German residential construction output was valued at USD 198.7 billion in 2015, while the output in France and UK was USD 117.5 billion and USD 98 billion respectively. This high amount of residential construction activities in these countries will augment the rapid strength concrete industry as the product is being used to build columns, walls, beams, slabs, panels, etc. at a faster rate than traditional concrete. Several new construction projects in the U.S. has been commissioned in 2016 with the government earmarking USD 1 trillion for the development and maintenance of infrastructure. Some of the projects such as the USD 1.6 billion worth DFW Connector project in Dallas, project Neon in Las Vegas, and the new bridge construction project in New York will increase rapid strength concrete demand in the coming years. These new mega construction projects will see higher usage of the rapid strength concrete as it can reduce the project timing by a considerable amount owing its quick setting nature. Infrastructure projects has also been fast-tracked in many other countries across the globe. Construction of new airports, bridges, tunnels, and roads in the emerging countries, for instance India and China will open up plentiful opportunities for the rapid strength concrete market size during the forecast timeframe. The rapid strength concrete industry is segmented, based on strength, into three types including 0 to 40 MPa, 40 to 80 MPa, and above 80 MPa. The 0 to 40 MPa strength segment held the largest share owing to its widespread applications in the construction of building, floors, parking areas, etc. It is primarily used in the construction of slabs and pathways which in turn will drive the segments growth during the forecast timeframe. The segment recorded a revenue of more than USD 150 billion in 2016. Rapid strength concrete market size with compressive strength of more than 80 MPa in 24 hours is chiefly used in construction of airfields and highways. The faster drying rate of this product along with its durable nature will increase its usage in the high-speed construction of roads and highways. This segment is likely to witness high demand in the coming years in North America and Europe owing to the significant number of new highway enlargement and construction projects in these regions. The segment will gain by a CAGR exceeding 6% during the forecast timeframe. Based on application, the total market size is segmented into roads/bridges, buildings/floors, tunnels, airfields, highways, and other minor applications such as parking lots, dockyards, etc. 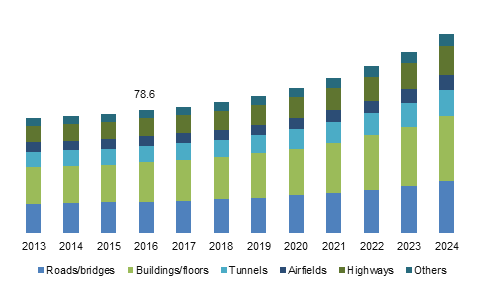 Buildings/floors is the largest application segment in the market which is probable to rise at CAGR close to 7.5% owing to the large number of residential and commercial building construction projects in Asia Pacific and other emerging regions. Rapid urbanization in developing countries such as India, Brazil, etc. has augmented construction for residential buildings in the region which will subsequently boost the overall market size in the near future. Highways is also a key application segment which accounted for more than 10% of the entire industry in 2016. The spurt in the number of new highway projects all around the globe, coupled with repairing activities on old highways will augment this application segments growth in the forecast timeframe. New airport construction projects around the globe will propel the airfield application segment in the rapid strength concrete market. Asia Pacific has the highest number of airport construction projects followed by Europe and North America. These projects will positively influence the airfield application segments growth which is likely to advance by a CAGR above 6% during the forecast period. North America is the largest rapid strength concrete market owing to rapidly increasing construction projects coupled with higher awareness about the product’s benefits. The U.S. having the largest network of roads in the world requires a large amount of concrete for its maintenance which in turn will fuel product demand in the region in the forecast timeframe. North America market will grow by more than 5% CAGR during the forecast timeframe. Asia Pacific is the fastest growing market owing to the high construction and infrastructure spending in countries such as China, India, Japan, etc. Building & construction activities has also gained momentum in the region due to increasing industrialization & urbanization. The construction of new airports, dockyards, tunnels and highways in the Asia Pacific countries will contribute in boosting rapid strength concrete industry size by 2024. 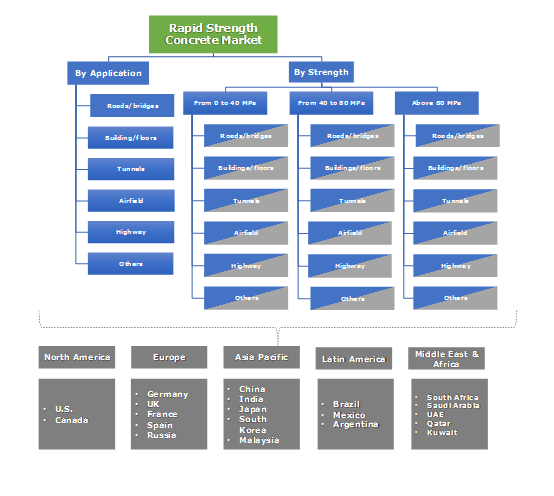 The major rapid strength concrete market players include Aggregate Industries, Boral Limited, Bostik, CEMEX S.A.B. de C.V, Sakrete, Perimeter Concrete, Short Load Concrete, Sika Corporation, Instarmac, Westbuild Group, BASF, Perimeter Concrete, Holcim, CTS Cements, Tarmac, Evecrete India, and others. The industry has a significant number of manufacturers spread across the globe. Companies are using acquisitions and mergers strategies along with new product development to enhance their market competitiveness. For instance, Sika Corporation acquired Butterfield Color in November 2017, which is a U.S. based market leader engaged in producing concrete floor products and systems. This alliance is likely to generate plentiful opportunities for the company’s growth in the near future by acquiring a comprehensive range of product portfolio. Robust growth in construction industry in Asia Pacific has propelled demand for rapid strength concrete. The construction of high rise and multi-storied buildings along with the need for eco-friendly materials led to the product market expansion. Rapid strength concrete’s usage in the maintenance and restoration of old infrastructure also led to its growing popularity in the business. The increasing construction spending mainly in the emerging economies will create a favorable environment for the industry’s growth in the future.